The North Amherst Community Farm non-profit is working to restore the original farm house that has been part of this local farm since the 1830's. This project is not only a legacy for the Ingram-Dickinson homestead of North Amherst, MA but will also provide affordable housing for apprentice farmers and future farm managers working with Simple Gifts Farm for many years to come. The history of the farm house offers an interesting view of how farming in the Pioneer Valley has changed over the past 200 years. Initially a grain and livestock farm, after the Civil War the farm shifted to raising meat and vegetables for local sales and shipping. In the 20th century ownership of the farm passed from the Ingram-Dickinson's to the Dziekanowski's, with the latter developing a dairy operation. In 2005, the Dziekanowski's sold the property to the North Amherst Community Farm, a non-profit entity formed to protect the land from development. NACF now leases the property to Simple Gifts Farm, managed by Jeremy Barker-Plotkin and David Tepfer. Simple Gifts is a leader in the local organic farming sector, growing food for the local community and maintaining the land and buildings in active farm use. Almost one-third of New England farms are managed by farmers over 65 years of age. To preserve the distinctive character of our region, strengthen local food security and continue our farming traditions, we need to cultivate the next generation of farmers! The state of Massachusetts, and the town of Amherst, have done a good job of preserving farmland, but housing costs can be another major barrier for young people seeking to get into farming. This project will help address that need. 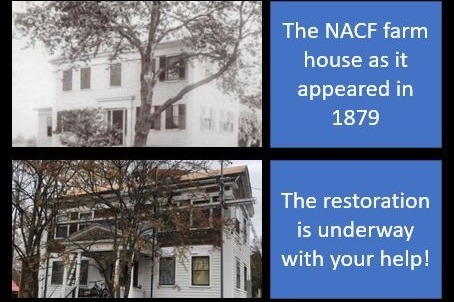 The restoration of the NACF farmhouse is being completed with the help of Community Preservation Act funding from the Town of Amherst. A critical first step was to hire a historic buildings consultant, Gregory Farmer, to assist us in researching the previous 180 years in the life of this important farm structure. - restore the building to its rightful place as an attractive presence on North Pleasant Street. For more on this story and pictures of the progress we are making, please go to our NACF Blog page . Through both financial gifts, in-kind donations, and volunteer labor from these groups, we are on track to complete this project by the spring of 2019. We need to raise $10,000 to finish the job and you can help! Thanks to your help, we have raised $1, 265 so far to continue the work on our farmhouse restoration project in North Amherst. I wonder if you might help us just a little bit more by sharing this campaign with a few of your friends.